The Hong Kong and Shanghai Banking Corporation first opened its doors for business in Hong Kong in March 1865. In 150 years of trading, the bank’s headquarters became a stalwart symbol of prosperity and stability, standing on the same site in Central at number One Queens Road. Three magnificent structures have stood on this spot, none more world famous than the last edifice, designed by Norman Foster and built in 1985. So what better way of celebrating this company’s endurance and strength than by a commemorative revamping of its flagship building? HSBC kicked off its 150th anniversary in Hong Kong with a three-part programme that included a digital makeover of its main building at One Queens Road, a commemorative HK$150 banknote and an interactive exhibition at the Hong Kong Maritime Museum. Illumination Physics was commissioned to help bring to life the first wave of the 150th anniversary programme – the digital makeover of HSBC’s headquarters. The north façade of the building has been fitted with three high-resolution LED screens, which have been installed within the glass structure itself and are all but invisible during the day. However, at night these screens ‘come to life’. 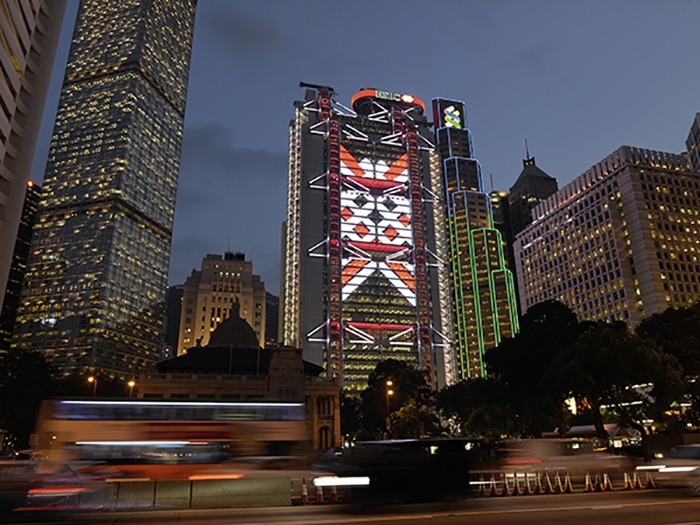 From 6.30 – 11pm they display images celebrating the city’s character as well as HSBC’s place within it, while also entertaining the nightly passers-by. These screens are so large and vivid that they can be seen from across the harbour in Kowloon. With respect to the design and installation, it was clear from the start that it would not be enough to simply replace the existing façade lights with superior modern technology designs. Something new and remarkable was required. A grand visual statement was essential to mark the 150th anniversary and distinguish the building from all others taking part in ‘A Symphony of Lights’. A lengthy evaluation of the proposal ensued and a lighting plan was born of necessity. With a six-month deadline, there was no time to completely re-wire the façade lighting and the existing power and data backbone was reused. Three new light fixtures were designed and manufactured by Illumination Physics specifically for this project. Custom versions of the manufacturer’s Wash 48 and Wash 24 were designed so that they could be mated to the existing brackets without fuss, speeding up the work of Illumination Physics’ installation team. This was vital for the program; 90% of the façade lighting would be installed from the permanent gondolas and in a living building there is competition from a number of tasks requiring the external access equipment. The lighting of this extraordinary building has always accentuated its main feature – the Exoskeleton, comprised of two ladder trusses that extend the full height of the building. Suspended from the ladders are the horizontal and diagonal brace elements of the Exoskeleton, measuring between twelve and eighteen-metres long. Early in the design a decision was made to use RGBW fixtures allowing for a distinct improvement in colour variety and colour mixing capability. The IP Wash 48 was used for the grazing of the main members of the Exoskeleton; the major change to the fixture was in the use of composite lenses. These fixtures illuminate the Exoskeleton at very shallow angles. It is not possible to alter the height above the illuminated plane by extending the yoke, so two sets of lenses were created within the same fixture to cope with the extremely close mounting position and any possible aberrations. In order to properly deliver light to the illuminated surface closest to the luminaire, the twelve LEDs at the base of the fixture were fitted with an asymmetric 10º by 25º lens, this mitigates hot spots or shadows close to the fixture. The remaining 36 LEDs were fitted with 5º lenses to promote the longer throw of light along the linear Exoskeleton beams allowing for a more uniform composite effect. The ladder truss required a similarly improved wash light. The IP Wash 24 was used with a composite lens of 10º by 60º. This enabled the accurate lighting of the underside of each rung of the ladder without spill. The refuge floors are another major feature of this building. These mandatory fire escape floors are wonderful open spaces; vast balconies affording magnificent views of Victoria Harbour and the city. Since 1983 the soffits above these double storey open floors had been illuminated as a feature. A wide angle lens version of Illumination Physics’ IP Wash 48 was used, which resulted in more saturated, enriched and brighter colours. The replacement of the previous metal halide with LED dramatically reduced the electrical consumption with a saving of around 90%, depending on the programming of the dynamic display. So the façade lighting had met its new objectives. How could the building now be used to celebrate the bank’s 150th anniversary in 2015 and into the future? Illumination Physics designed three media walls that were integrated into the glass façades between the refuge floors. The top screen measures five floors high, the centre screen measures six floors high and the lower screen covers seven floors. This seamless integration of equipment is all but invisible from the outside. A linear LED strip just 15mm wide was attached to the inside of the outer double-glazed glass layer. Throughout extensive testing, a variety of horizontal pitches were tested until the optimal compromise was found which provided more than 90% transparency for the vision glass panels. Illumination Physics created three vast media walls which can be used to create one composite image or three separate scenes. Every evening, these media walls awaken and visually communicate the tale of the 150 history of HSBC in a spectacular way. The Exoskeleton HSBC main building is unique in more ways than one. It consists of large triangular shapes that coincidentally make up the HSBC logo. Media content was created on a black background that displays dynamic diamond and triangular kaleidoscopes that are a virtual metaphor of the building’s physical Exoskeleton. The media is always combined with the façade lighting and together they create a lighting display that is synergistic. The Illumination Physics Systems and Control team faced many challenges when presented with the HSBC light show project. Not only were there 700 universes of DMX required for the mammoth task but these needed to seamlessly integrate with no visible lag in response times. Illumination Physics specified a control system that would meet these requirements. It was decided early on that a high capacity low latency network was essential for the media screen and façade lighting control systems. Cisco equipment was chosen for the task of distributing 708 universes of DMX control via Artnet and sACN. The media wall alone requires a consistent 130-140mbps of Artnet traffic to be delivered with low latency and jitter across all 85 DMX nodes. System testing demonstrated 700us response times across the infrastructure thus avoiding any capacity and lag issues. The capacity and design of the network allowed for multiple control systems to be effectively separated while using the same physical infrastructure, reducing overall costs as changes were made throughout the planning and commissioning phases of the project. Remote control was also required for various emergency procedures and monitoring. A fibre connection was supplied by HSBC for this purpose and allowed reliable time synchronisation for the system’s master clock, as well as various triggers from third parties to control the system remotely. A Cisco firewall was used to provide secure access solely to the required devices. Longevity of the install was key criteria when selecting hardware for the project. All external components were chosen for known reliability and service back up. These devices needed to be compatible with a wide range of control protocols. The nodes allowed for future proofing as well as control changes if required through the run of the project. The final commissioning of the system took place over January and February this year. Much of the lighting was programmed offline using Capture Argo, with final sign off live. The media content was also scheduled and added during the final commissioning period.